The trail gradually takes height till 8 days from Lukla 2800 meters from sea level to Everest base camp height of 5365 meters, so during a trek, you can fell subtropical climate to alpine climates with changes of different vegetation, settlements, and animals. Get through a Namche bazar big town in Khumbu region, where bazar going on twice a week. You can’t imagine all the wood and tin carried by a potter in Namche Bazar and Irish bar, coffee shop, massage center, banks in height of 3428 meters. The wonder of the Himalayas in the Khumbu region is one of the life events with experience of world highest base camp. Small historical Buddhist settlements Tengboche decorated with the biggest monastery and heavenly panoramic views of massive mount Everest, lotse, ama dablam, thamserku, tabuche, khangtenga and many more. View from kalaphatar seems like 360 degrees dramatic artificial with Everest Himalayas range, glaciers, and different peaks. Our Everest base camp is full board package trekking with permits, guides, potters Both way flight fares, all ground transfer, food and accommodation during a trek on a mountain. Back all the way down seems so easy and short which will be done in three to four days. Some of the people who have a limit time and do not like to hike down the same way they can choose chopper to fly back from Everest base camp or Gorak Shap. This also another experience to collect a beauteous trip in a lifetime. Who have longtime you can do Everest base trek with Chola pass. Namche Bazar, the bustling market town in the heart of Sherpa country. 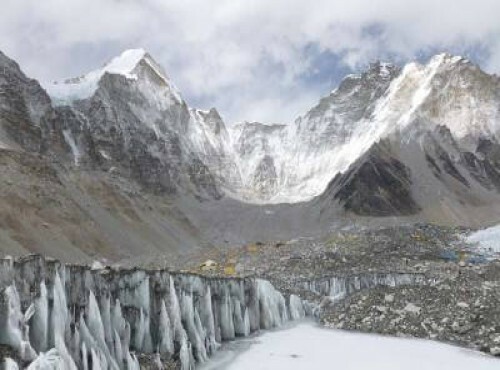 Everest Base camp with Khumbu icefall and Khumbu glacier. Biggest Buddhist monastery in Everest Region Namche, tengboche, khumjung and pangboche. All your standerd Meals (breakfast, lunch and dinner) during the trek. A highly experienced, helpful and friendly government license holder Guide, his food,accommodation, salary, insurance, equipments, medicine. Day 01Arrival in KathmanduArrival in Kathmandu. Our Airport Representative will meet you at the Tribhuwan International Airport. A drop to the Hotel by private tourist vehicle is arranged. You can either take a rest or meet us at our office and know the detail arrangement of the Trek. Overnight stay at the hotel. Day 02Flight from Kathmandu to Lukla, then trek to Phakding (2652m): 3-4 HoursEarly morning the drive from hotel to domestic airport terminal after breakfast. The flight to Luklagives outstanding views of early morning sunrise on the snowcapped mountains. On landing Tenzing-Hillary Airport after a 40 minutes at Lukla, we reach the gateway to theHimalayas. The trek begins from the airport itself soon after meeting our crew there from where Phakdungis a short walk. As this is the first day of the trek, we rest in Phakding. Day 03Trek from Phakding to Namche Bazaar (3440m): 5-4 HoursStarting early in the morning, the route passes through beautiful pine forests, DudhKoshi River and views of MauntThamserku. After passing a few settlements we a checkpost, the entrance of Sagarmatha National Park. We further walk through the confluence of DudhKoshi River and BhoteKoshi River, and take a steep ascent to Namche Bazaar where the first sight of marvelous Mount Everest and ridges of Mount Lhotse and Mount Nuptse welcomes us. Day 04Namche: Acclimatization and Rest DayNamche Bazaar, the biggest settlement in the Khumbu region, is well facilitated with ATMs, Internet cafes, restaurants, bakeries et cetera. Although it’s rest day for acclimatization, we go for a short hike to a nearby viewpoint (Thame or Khunde) and take a tour of the place including the Tourist Visitor Center where information about Everest climbers, Sherpa people and their culture and flora and fauna of the region are briefed. Day 05Trek from Namche to Phorse Village (3800m): 5-6 HoursAfter breakfast in Namche the Trek toPhorse begins. One can reach Mugla Pass and view the beautiful glimpse of Mount AmaDablam, Mount Khumbu and Mount Thamserku. Upon decending to the DudhKoshi and crossing the bridge and the trail ascends through rhododendron, pine and oak forests to reach Phorse. Overnight stay at a lodge in the village. Day 06Trek from Phorse Village to Dingboche (4360m): 6-7 HoursTrek from Phorse to Dingboche starts the other day with a visit to biggest BuddistMonastry in the region.The journey continues through alpine forests to a large village of upper Pangboche and further through villages of Shomare, Orsho and TsuroWog. One can view beautiful view of soaring mountains of Taboche, Mount Thamserku, Mount AmaDablam, Mount Nuptse, Mount Cholatse and Mount Lhotse along with others while passing through the KhumbilaKhola valley to ridge top. On moving further through the trail through ImjaKhola eventually Dingboche is reached. Day 07Rest day in Dingboche Today we have a day to acclimatize. Either we can hike to Nagarjun hill or visit to chukung village. this trekking program is focus for beginners that's why every 1000 meters of a hike we have a rest day. overnight at dingboche. Day 08Trek from to Lobuche (4940m): 2-4 HoursDuring the trek after walking up the steep terminal moraine of the Khumbu glacier, the ascent to ChupkiLhara begins where one can find the slopes with boulders. One comes across the collection of stones with prayer flags used as memories to American mountaineer Scott Fischer and to BabuChhiri Sherpa, the 10 time Everest Summiteer Nepalese citizen. Beautiful view Khumbutse, Mount Lingtse, Mount Pumori and Mount Mahalangur can be viewed as the trail crosses the Khumbu glacier where little symptoms of altitude sickness can be experienced. Day 09Trek from Lobuche to Gorakshep (5150m) to Everest Base Camp (5364m), back to Gorakshep: 7-8 HoursThis is the most important day of the Everst Base Camp trek route. At Thangma Riju one can experience the 360 degree panaromic view snowcapped mountains. Actually Mount Everest is not seen from here however Mount Nuptse, Mount Nuptse and Mount Pumori can be viewed very well. Below Mount Pumori a grey grassy land of Kalopaththar can be seen after climbing up the steep through terrain of Changri glacier. Day 10Trek from Gorakshep to Kalapatthar (5545m) to Pheriche (4280m): 7-8 HoursOn the climax of this trip the trek starts much early in the morning so that trekkers can witness the glimpse of the Mount Everest when the dusk turns to bright morning with light of the day. On the way Peak s Lingtren, Khumbutse, Changtse are viewed. It is recommended that during the ascent to Kalapththar which takes hours one pauses and catch breath while snapping the photos at times. Panaromic view of Himalayas can be seen at Gorakshep. The descent to Periche begins after Lunch. Day 11Trek from Pheriche to Namche (3440m): 6-7 HoursThe descend continues through the Jame route back to the terminal moraine at Duglha, passing through the beautiful village of Pheriche and Orsho along with Shomare. On reaching Pangboche village one can explore the oldest monastry in the region which has the legend of storing scalp and bones of YETI, the repulsive snowman. Moving further over the bridge aboveDudhKoshi River and DudhKoshi gorge down the descent through pineforests, the path reaches Sansa trail junction. After lunch the trail to Namche bazar continues appreciating the marvel of Mount Amadabla, Mount Lhotse, views of the tip of Everest and Tengboche on the trail route. Day 12Trek from Namche to Phakding and then to Lukla (2800m): 5-6 HoursThe last day of the trek continues with the steep downward trail. Trekkers need to walk really slow very controlled and in a balanced manner on the steep rocky terrain until reaching the suspension bridge over DudhKoshi, passing through the open plain, rhododendron forest while enjoying distant view of snow covered mountains. Finally Lukla is reached. Day 13Flight back to KathmanduThis is the day when Mountain flight from Lukla to Kathmandu is enjoyed over once again. On reaching Kathmandu it is time to enjoy shopping and walking round the city. The evening is to celebrate for successfully completion of Everest Base Camp trip. Day 14Final Departure or onward for next program The final day in Nepal is the last time one can enjoy shopping and have pleasant sightseeing around the cultural city of Kathmandu valley before leaving for Tribhuwan International Airport on scheduled flight time. Depature for Everest Base Camp trek on upon your request. We stayed at Deepak’s hotel, ‘Hotel Florid’ in Kathmandu. We booked a porter-come-guide at the hotel. Our guide/porter ‘Rabin’ was extremely helpful and nothing was ever a problem for him. We’d recommend you request him for your trek. Whatever we wanted, he made happen. We know he was exceptionally good because after speaking to other westerners, we found out serval of them had small issues and problems with their guides and porters. We did EBC and then planned on the 3 passes and Gokyo to see the lakes. We enjoyed Gokyo the most and if we had to choose, would do that over EBC. Deepak was also extremely helpful when ever we had a problem. There was constant and clear communication via a cell phone that our guide carried. Any problems were fixed right away. We weren’t left on our own in sticky situations and when I got altitude sickness we got the proper advise and management from Deepak. We felt taken care of and guided every set of the way, which meant we had a smooth and enjoyable trek. Book ‘Rabin’ as your guide and stay at ‘Hotel Florid’ in Kathmandu. Eat at ‘The third eye’ in Kathmandu for great Indian food and book a trip through mountain rock treks. Often the Kathmandu-Lukla-Kathmandu flight gets delayed by a few hours or may even be canceled for one, two, or more days due to unfavorable weather conditions. Such conditions may arise even in the best seasons. Hence, in such cases, you must be prepared for long waits both at Kathmandu or Lukla airports, as this can happen either at the start or end of the trek or even both! We do our utmost to avoid such delays and fix you on the next flight. Still, we suggest you to be prepared for possible delays/cancellation, and if possible to come with some extra buffer days (1-2 days) at the end of the trip to accommodate such delays. We also organize heli rescue in such conditions, if it's available and upon request by our clients. The helicopter charges around USD 4400 and it can lift 4-5 persons per flight. If everything runs smoothly and if interested, you can also enjoy other activities like sightseeing, rafting, wildlife activities, shopping, etc during your buffer days. In case, the flight delay/cancellation happens at the start of a trip and it goes so long that it disturbs your onward travel schedule, you are free to choose an alternative trip: such a trek in the Annapurna, Langtang, or any other regions. If you are not interested in the alternative trip and would rather wait for the trip, you are welcome to wait in Kathmandu for as many days as it takes to get a flight to Lukla. However, please note that there will be no refund if you lose your time waiting at the airport and do not take an alternative tour or you only do short trek later due to time limitation. If the cancellation happens before the trip, we will provide you with accommodation and lunch in a guesthouse in Kathmandu. In case of the flight delay/cancelation after finishing of the trek, you will be responsible for all your expenses. Please also note that you will not be entitled to any refund for the services (such as hotel, transport, flight, etc) included in the package that you would not use later.